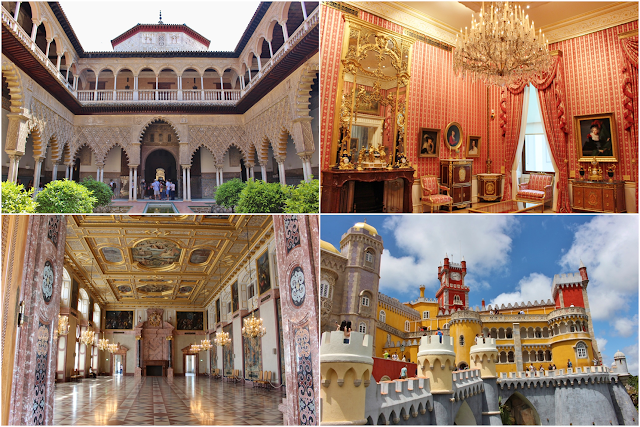 From Sevilla to London, from Munich to Sintra - some of my favourite places I visited. It's Friday night in my neck of the woods and after a week busy with work and everything else going on in life, I planned on writing this weekend's post for this blog. Frankly, I hadn't yet completely decided which of my castle adventures I wanted to write about cause there are still at least 19 to go - you see, I usually open a draft for every castle, palace and other royal sight I visit to remind myself to one day write about it -, when I was struck by the fact that I had published 264 posts on this blog. Between royal events, CastleTalks, period dramas and other features, I then wondered how many castles I had covered yet. So I hopped over to the "Visited Places" section and did the maths. Lo and behold, Schloss Weikersheim was actually the 101st sight I wrote about. In addition to castles and palaces, there are also a few royal-related places such as churches and burial sites. Apart from wondering about the fact at what point you start calling it an addiction, it also made me think about what I enjoy so much about visiting a castle. Anywhere I travel, I seek out castles to have a look at. I'm not sure I can pinpoint the moment it started. I know I have enjoyed visiting royal sights for a long time as I have been interested in royal history since I was a teenager. (It was a visit to the now-closed Fürstenhaus in Hanover with my school that kicked off my royal interests.) Confessions of a Castleholic, which I started in 2014, certainly enhanced my love. It's just a pleasure to share my love with fellow castleholics. It's not always that easy being a castle adventurer as not all friends are always too inclined to visit the gazillionth castle during a holiday. (My not so heartfelt apologies!) I'm, however, long past the point of feeling strange about being on my own and/or the only person under 50 on a castle tour. I just love it too much. There is something hauntingly beautiful about castles and palaces. For some, it is their location. For others, it is the history attached to them or their sheer size. And for yet others, it is because they are simply out of a fairytale. Each castle is unique and a combination of all their attributes is what appeals to me. I am a lover of history for almost as long as I can remember, I admire architecture and like looking at art (even though I got no clue about the two latter ones and every expert would probably shudder at my definition of what great art and architecture are). And in castles, it all comes together - it's the perfect blend. Truth be told, I would never want to own a castle. Sure, I would never pass up the chance to float down the grand staircase of Würzburg's Residence in a stunning gown or waltz through the ballroom of Catherine Palace, but I have read too much about castles and the struggle to keep them up to want one. I can see the beauty without worrying how to fix the roof, polish the lustres and keep everything in shape. It is a beautiful world from the outside but it can be quite daunting when you have a closer look. Instead, I enjoy the walk through history a castle visit is. May it be in the footsteps of the Swan King, Ludwig II of Bavaria, Friedrich the Great and his palace "without worries", the fortifications built by the Holy Roman Emperors or the Moorish architecture of the Iberian Peninsula. Visiting a castle is like diving straight into another period of history (where in real life I would have probably been the third kitchen maid or something along those lines). It's by walking endless corridors clad with armour, discovering magnificent ball rooms and everything in between, that brings you many encounters with tales of war and tales of peace, tales of honour and of romance, tales of sanity and of insanity along the way. It's easy to dive into history of long ago and more recent times as you stroll through hallways once and maybe still travelled by royal and noblemen. Every room holds a story, every stone tells a tale and many of the pieces on display whisper their own secrets of an era gone by. Luckily for me, the supply of splendorous palaces, beautiful castles and impressive fortifications is almost impossible to exhaust. Though getting to them may just take a bit more of a travelling effort by yours truly. Onto the next 101 castles - and more!